I'd like to start a new thread here for posting of soda and or beer can models that I made on anything, like, planes, cars and animals etc. To start the ball rolling (or to open the pandora box), I'm posting a project that I commenced about 4 to 5 years ago. It was supposed to be a beer can plane, 1/33, bare metal side out, made from Fly Models A-20 Havoc kit. Stopped as shown in the pictures as I ran out of superglue that disappeared from the market. Though I did stock up some 2 dozens or so beforehand, the glue dried up after not being used for some time. And another reason was that I hadn't seriously considered paper as a medium to go between layers of can. Have actually given up but didn't want to throw it away but kept them just for looks and imagined that sometime I would come back to fix it. Time passed by 4 to 5 years now........the pictures show when time stopped on that project. The template print outs to glue on the cans were either lost or some parts missing now. Maybe the flame to re-build soda car models has now rekindled as I have now the newly found superglue and the method to proceed. A word of warning to those who would like to try their hands (fingers in particular) on this, the aluminium can sheets are pretty sharp and will cut your flesh open without mercy if you don't treat them well, or being careless. Kids should stay away when you do the job! And, first-aid tapes, and in emergency situations, ambulance call numbers ready on post-it board!! (Scared by all these exaggerations? Can be real!) The superglue fume is toxic and should use the glue under good ventilation. I actually don't care but just stay an arm away when I apply the glue and hold my breath for as long as I can. Or do a washroom round, or, get a drink. and some photos of past items that I couldn't find on the forum. Title: Can I have some more, please? interest in developing craftsmanship along these lines using paper modeling techniques. I learned to stay away from cyanoacrylate Hot Glues with their cumulative lung problems after two hospital visits in one year. yet found a better contact aluminum can glue. Thanks for visiting, Ron, and for sharing, Bob. Those models you made are simply gorgeous. Wonder if you used the whole can as it is in the belly part of the helicopter? No whole can was used in creating the helicopter but it does look so in the photo. I have not figured how to get a smooth curve railing. Take a look at the forward rails on this time machine. What brand of adhesive do you use? I considered trying this a while back, but my big holdback was glue. I've been experimenting with aluminum for a while now. Glad to see you "entering the fray" so to speak. Below exhibits a soda can derived aluminum tail cone surface for a A6M2 Zero. It's banged up due to a long period of "hangar rash." The one behind is formed from dead soft 0.005" tooling foil. 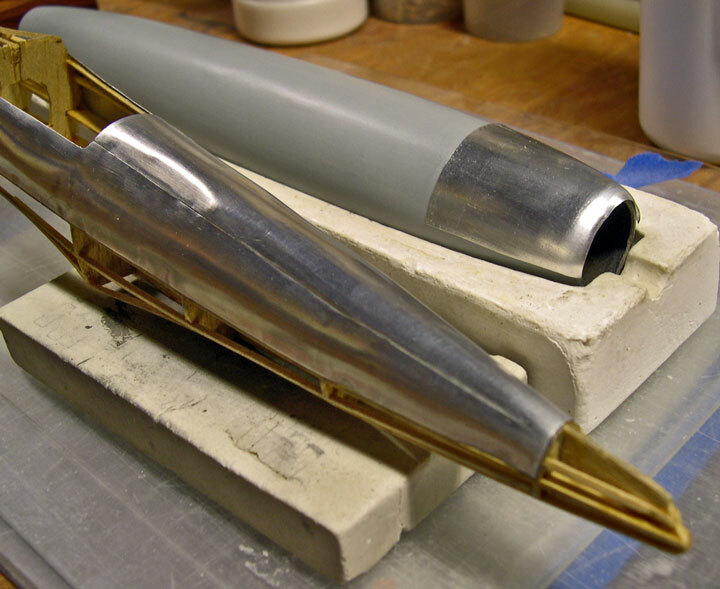 I now prefer tooling foil and a slightly thicker variety for making formers and stringers. I've found what might be called the idea glue for aluminum - "Loctite Super Glue, Ultra Gel Control." Properly cleaned surfaces bond exceptionally well and the dispenser allows great control of placing "droplets" on the aluminum surface. Thank you for stopping by, Vermin King and Gil. Gil, yours is a bit too advanced for me as I'm just trying out building soda can models at a comparatively lower level using soda or beer cans that would end up being thrown away as trash or for re-cycling. Anyway the pic looks great and I wonder if we can see the final product sometime soon? For now, I'm building Murph's B-737 100 at 1/144 with some build pictures up to finishing with the fuselage. The purpose is to show the use of paper (cardstock in this case) as tabs to hold the parts together just like normal building in paper. The result looks quite alright to me. Another tips is to use sticky tapes over the surface before applying superglue. I have forgotten at some places along the way as you can see from the pictures.